Ah, salsa. The cherry on the nacho cake. Okay, lousy metaphor for a wonderful condiment. Salsa comes in smaller, pricier jars than tomato sauce, so surely it must be harder to make? NO?! NO! It’s not. Blast! If anything, it is easier. It can be made in a frying pan using just 2 pounds of tomatoes! No kidding. The following recipe is for salsa as simple as it gets. K.I.S. I like to leave of the last S, becuase it’s unnecessary, but inevitably I think Stupid, anyway! Rinse two pounds of tomatoes and blanch in a large pot of water to a boil. Let the water come back to a boil and cook for approximately five minutes. The skins of the tomatoes should be just splitting open. Cook too quickly and the skin will still be attached, cook too long and pulp will exit the cracks in the skin. Cool tomatoes under running water or in an ice bath. After your tomatoes are peeled you can take a break and let them rest overnight and a lot of the water will drain off, or if you’re feeling energetic, proceeded with the salsa. Draining the additional water off can help produce a thicker salsa more quickly. Chop 3- 5 ounces of green chilies for a mild-medium salsa. Approximately 8 oz for hot. Bell peppers can also be added, but are optional. Combine the ingredients in a skillet and simmer for about 40 minutes until the tomatoes break apart, mostly. I used about 2 tsps of salt and 1/4 C of brown sugar for two pounds of tomatoes. Salsa, being a condiment, known for being piquant, (as in Picante) requires stronger seasonings than you would normally add to a sauce or main dish. A lot of things in the kitchen come with hype, whether is a grilled sandwich called a panini or gourmands who brag that they would never touch anything other than homemade tomato sauce. In most cases the hype, is exactly that, something that dissolves when the truth is discovered. That is exactly why I am posting today, to dispel myths that tomato sauce is hard to make. The one truth about homemade tomato sauce is that is IS more intensely flavored and overall a different animal that store bought- sauce. There are two simple methods for making tomato sauce, one is best suited for making it “by hand” and the other using a food mill. Begin by finding as many tomatoes as possible. To make one quart of sauce it takes approximately 5 pounds of tomatoes. Add rinsed tomatoes, let the water come back to a boil and cook for approximately five minutes. Chop all of the tomatoes and 1 onion. (Use onions and other seasonings sparingly as they become stronger during long-term storage. I also add a little parsley, oregano, and basil. After40 minutes the tomatoes should smell cooked and they should be at a sauce like consistency. Season with salt and sugar to taste. The amount required depends on the quantity and flavor of the tomatoes used, which varies every time. I used 2 tsps of Salt and 1/4 C brown sugar. 1 tsp Salt and 2 TBSP of Brown Sugar should be suitable for smaller batches. I found brown sugar to be most pleasant in the sauce than white. The richer molasses flavor blends much more easily than the blunt sugariness of granulated sugar. Thicken with a flour/water slurry if necessary. Ideally the tomato sauce should coat the spoon. Now your tomato sauce is done, how easy was that! Give it a good taste, notice how it taste like tomatoes, notice how you can taste the freshness and nuance of every ingredient in the sauce. Amazing! Package and enjoy! If you happened to have a food mill/squeezo, etc., that’s great because they can make massive quantities of sauce very quickly. Chop tomatoes with their skins on and follow the “Sauce” section of the recipe, after 40 minutes of cooking, run the mixture through the food mill. If you wish, reserve some of the sauce to make it chunky, or run it all through the food mill for a smooth puree. Removing the skins, either through a food mill or by blanching, is important because of their bitter taste and leathery texture. On the right is my BST tomato sauce mill. It is one of the most simple food mills, a crank, a bladed wheel and a fine mesh screen and is not changeable, unlike Squeezos. It also has a large hopper than can be filled to the brim. For $10-$15 on eBay it’s so worth it! Squeezos are SO expensive brand new. 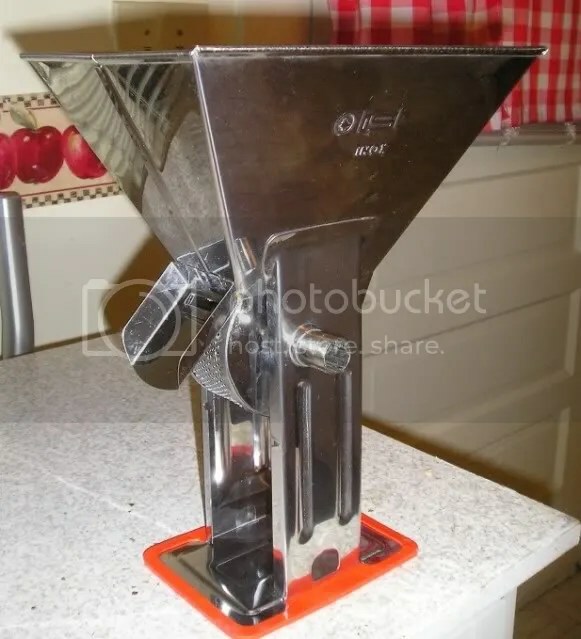 I definately recommend checking on eBay you never know when someone wants to get rid of a food mill they never use! 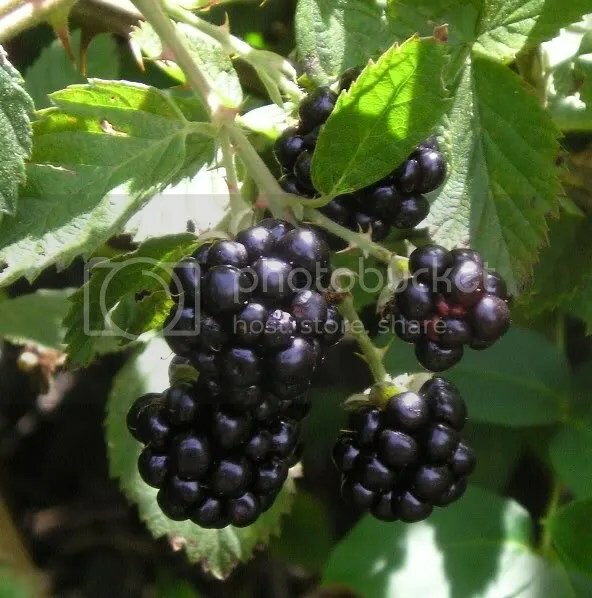 It’s mid July the height of blackberry season. 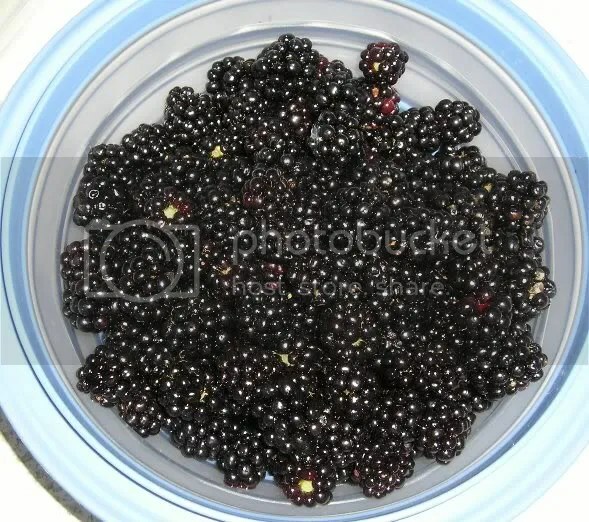 Berries, like black gold, are a seasonal treat to be savored while they last. We always manage to eat all the before before we get around to making anything, but if you have a ton of berries to use, a lovely seasonal Blackberry-Apple pie would be a great way to use them! Here’s a Recipe from “Farm Journal’s Best-Ever Pies” cookbook. I haven’t tried it, but their recipes are always spot-on. 1 C. Tart apples, pared and sliced. Mix fruits together. Whisk dry ingredients. Mix dry ingredients with the fruit. Pour into your pastry shell, dot with the 2 Tbsp of butter. Cover with the top crust and slit for steam to escape. Bake at 425 for 40 to 50 minutes or until the crust is golden brown and the filling bubbly. Cool before eating, if you can wait! What do you do when life gives you tons and tons of zucchini?….make zucchini bread! Sift together flour, dry ingredients, and spices. Mix together oil and cocoa, blend, add sugar and mix until granular. Pour in buttermilk, mix, add flour 1/3 at a time. 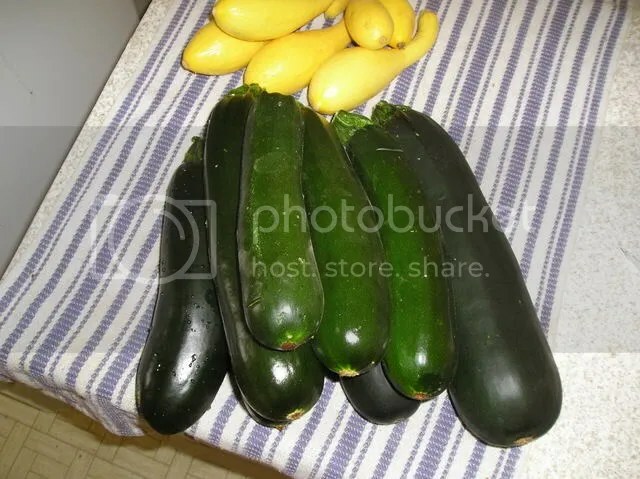 Stir in grated zucchini and pour into buttered pans or muffins tins. 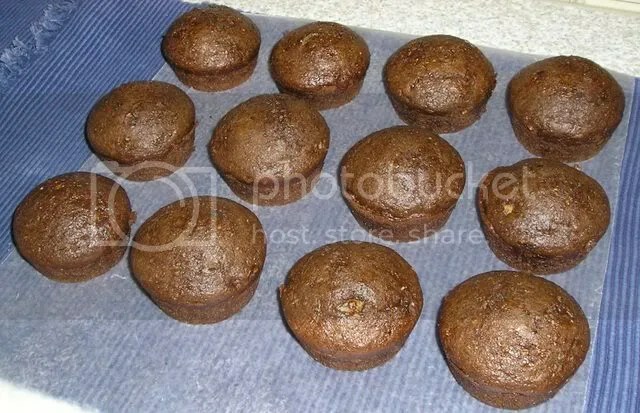 Muffins take about 20 Minutes at 350 degrees. A thicker loaf pan will take approximately 50 minutes. This would also be great with chopped nuts, chocolate chips, or raisins.